In 1903 Arthur Edward Waite, with the help of two friends succeeded, in taking control of a faction of the London branch of the famous occult society the Golden Dawn and created a smaller separate group. Under Waite’s direction magical practice and divination were frowned upon. Waite believed that the main purpose of occult practice was spiritual transformation – the search for enlightenment – and this became the focus of the group. 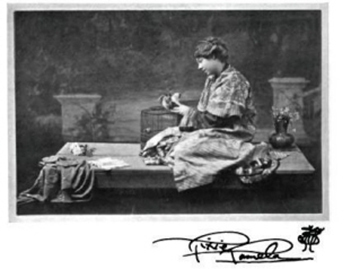 One of the members of this group was the gifted artist Pamela Colman Smith. Smith had studied art in the Pratt Institute in Brooklyn. As an adult, she settled in England and made her living as a set and costume designer at the Lyceum Theater, and as a storyteller, an illustrator, and a fine artist. In the early 1900’s, she regularly showed her work in New York at the gallery owned by the famous photographer Alfred Steiglitz and received critical acclaim, particularly for her visionary drawings. Smith was part of the Symbolist art movement that was prevalent at that time. Symbolists were noted for the sensual beauty of their work and for the portrayal of subjects based on mythology, dreams, and fantasy. As an artist, a psychic, and an occultist, Smith was well suited to this style. She tended to work intuitively and spontaneously. When she was not illustrating a particular legend or story, she would allow herself to fall into a light trance while listening to classical music and draw what she saw. For example, once, while listening to a composition by Beethoven she painted a majestic queen in flowing robes standing on the sea carrying a small ball-like moon in her hands. She will go far because she believes in all her ideas… She has the simplicity and naiveté of an old dry as dust savant (but) with a child’s heart. In 1909 Waite hired Smith to create a new artistic Tarot. He was hoping that with Smith’s talent she would make a deck that was both an appealing work of art and one that clarified the mystical story in the Tarot. Like a Renaissance artwork, it would have body and soul, beauty and meaning. Of course this deck was destined to become the most famous Tarot deck in the world. The deck was originally named just The Tarot, but it became The Rider Waite Tarot in the U.S. and now commonly referred to by scholars – to acknowledge Smith’s role -as The Waite-Smith Tarot. But, what was Smith’s role? I often fine in books and articles that Waite is referred to as the designer of the deck; sometimes, even in recent books, Smith is not mentioned at all. I do not believe that the term designer should be applied to Waite. One cannot design a visual work of art by describing it in words and Waite possessed no talent for visual communication. He hired Smith to design the deck because she did possess the talent. As an artist and a writer myself I find that people often have trouble separating these roles. On my first two decks, The Alchemical Tarot and The Angels Tarot, I designed and illustrated the decks and coauthored with Rosemary Ellen Guiley the accompanying books. Yet in early reviews it was stated that I co-designed these decks. I saw to it therefore that Pamela Colman Smith should not be picking up casually any floating images from my own or another mind. She had to be spoon-fed carefully over the Priestess card, over that which is called the Fool and over the Hanged Man. Waite specifies that he paid special attention to the direction of the three trumps listed above but we cannot assume that he had as much control over all of the cards. Now, let’s look at the time frame in which Smith completed this work. Smith was in New York attending a show of her work at Stieglitz’ gallery in March or 1909. By necessity, she would have been working in January and February on the pieces that she would need for her show. On November 19, 1909, Smith wrote a letter to Stieglitz in which she mentions finishing her Tarot. The deck did come out in December and it is unlikely that Smith’s artwork could be transferred to plates and printed in less than two weeks and at the time that Smith is writing she seems to already have the original art back from the printer. We, therefore, can assume that she worked on the designs sometime between May, when she returned from New York, and October, the latest she could have delivered the art to the printer – within a five-month period. It is common for an artist to take a year or more to create a Tarot deck, I certainly do, and six months or less is a short time to produce eighty designs (there are seventy-eight cards in the deck and no one is sure what the other two designs were but perhaps they were a title card and an advertisement card) even for a spontaneous artist like Smith. Also, from Smith’s message we may surmise that she was not paid half of a year’s salary for this work, which may have made it necessary for her to complete other works for pay during this six-month period. Even when it is clear that Waite did not design the deck, many people still assume that Waite oversaw every aspect of the design of the Waite-Smith Tarot and attribute even the smallest details on each card to his direction. This type of interaction between an artist and a director, however, would have been tedious and time consuming and given the short amount of time in which the deck was created it would actually have been almost impossible for Waite to have had this much input in all seventy-eight cards. It would have been highly impractical for Waite to be standing in Smith’s studio looking over her shoulder everyday during the months that she was working and he would have to choose which images merited his attention. Waite has continually expressed in his writing that he was most concerned with the symbolism of the Major Arcana, which he saw as expressing the mystical quest, and we can also infer from his writing that he would have been less concerned with the Minor Arcana, which he associated merely with divination. It is most probable that for the Major Arcana Waite described the design that he desired for each card, complete with the symbolism it should contain and the significance of each symbol, and, then, he would have stepped out of the picture and let Smith work in her usual spontaneous and intuitive manor – it was Smith’s intuitive psychic ability that convinced Waite that Smith was the right person for task in the first place. Although the original art for the deck no longer exists, we can see from the printed copies that Smith drew the designs in black ink and colored them with watercolors in her usual manor. Art produced in this manor cannot be edited. If Waite desired changes once a design was complete, Smith would have had to recreate the entire piece, and considering the short time in which the work was completed that can not have happened often. It seems that Waite gave Smith more freedom to express her visionary talent in the creation of the fifty-six Minor Arcana, which comprised the bulk of the work. Unlike earlier Tarots, which commonly display only a repetition of the suit symbol and possibly some decorative details on the pip cards, the Wait-Smith pips are illustrated with complete scenes in which figures interact with the correct number of suit symbols on each card. These scenes are allegorical and express the intended divinatory meaning of each card. As this innovation is one of the outstanding characteristics of the deck, it is likely that Wait requested it. We can also gather that he explained the general elemental and symbolic structure of the four suits, and provided a list, from the teachings of the Golden Dawn, Etteilla, and other sources, of traditional meanings that are associated with each card. These lists are included with each minor card in The Pictorial Key to the Tarot. Many of the meanings are contradictory and Smith’s illustrations convey only some of the listed meanings. As we can see in Waite’s descriptions in his book, Waite seems to have formed his opinion on which meaning is being conveyed after Smith created the illustrations. It is, therefore, likely that Smith chose from Waite’s list the meaning that she wanted to convey for each card. Further evidence for Smith’s independence in the creation of the Minor Arcana can be gleaned from the fact that many of the characters and symbols that she incorporated in the pips are modeled on her own paintings that she completed sometimes years before receiving the commission. Many observers have also mentioned that besides the Tarot of Marseilles many of Smith’s illustrations for the Minor Arcana are clearly modeled on the 15th century Sola Busca Tarot, the only Renaissance deck to have figures and complete scenes on the pips. A complete set of photos of the Sola Busca engravings had arrived at the British Museum two years before Smith’s commission and was certainly available for Smith to study. It is known from Waite’s memoirs that he was a frequent visitor to the museum and he may have recommended the Sola Busca deck to Smith – in The Pictorial Key to the Tarot Waite acknowledges that there is an historic precedence for the fully illustrated pips. Also in the first article to be published about the deck, in the December 1909 “Occult Review,” the editor of the magazine introduced the deck and mentions that it was designed by Pamela Colman Smith, who did extensive research of historic Tarot decks. The pips in the Sola Busca deck contain scenes in which figures interact with the correct number of suit symbols for each card in the same way as Smith’s pips. Although we have no evidence that the images on the Sola Busca pips were intended to illustrate their divinatory meaning, other than a rare 19th century Russian edition of the Etteilla deck, this is the only Tarot that made use of this novel approach before the Waite-Smith deck. Besides taking the same approach as the Sola Busca, the Waite-Smith cards are also the same proportion as the Sola Busca cards, and many individual cards are obviously modeled on individual Sola Busca cards. 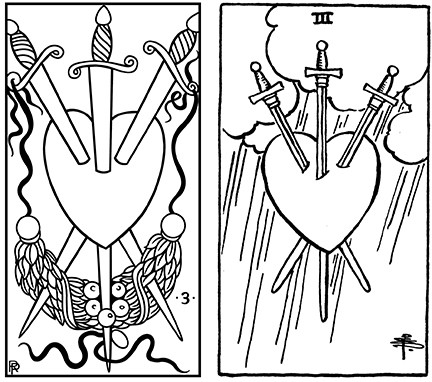 The most obvious example is Smith’s three of swords which contains an image of a heart pierced by three swords that is almost identical to the image on the Sola Busca three of swords. Besides the pips many of Smith’s royal cards are also modeled on Sola Busca royal cards and even the her Fool seems to be modeled on the Sola Busca five of cups which contains a similar figure with a small dog at his feet. Many other images found in the deck can be connected with figures found in paintings in the British Museum and in museums in Holland. It is likely that Smith found inspiration in these works as well. As we can see, although Waite gave the initial instructions to Smith for what he intended the deck to convey he could not have overseen the entire creative process nor controlled the numerous and subtle influences that Smith incorporated into the work. It is only when he saw the finished art for the cards, that he wrote his impressions and added these before the lists of meanings in his book. The fact that these descriptions were only written after the art was complete is evident in the nature of the text. It reads like a description of a first time observer, one who, at times, misunderstands what he is looking at. This is especially obvious in his description for the Ace of Cups, Waite says that there are four streams pouring from the cup and the picture shows five. For the Six of Swords, Waite says that “the course is smooth” but the water is smooth on the viewer’s left and choppy on the viewer’s right. It is different on each side of the boat, which suggests another meaning. Waite says that the man on the Seven of Pentacles is resting on his staff but the man is resting on a hoe. This figure is based on a painting popular at the time depicting labor and Waite seems to be unaware of the source. Even with Waite’s descriptions of the trumps we find mistakes. When is describes the Devil and the Chariot, he includes details found in Levi’s descriptions of thee cards that are not in Smith’s illustrations. As more and more of Smith’s sources are uncovered and the early mentions of Smith’s role in creating the deck come to light, I hope we can finally put to rest the myth that Waite designed the deck that is connected with his name, and that Pamela Colman Smith can receive the credit that she deserves.